Welcome back to our annual pumpkin carving contest. For six years now, we've been discovering some of Sacramento's best pumpkin sculptors and carvers. Can you hang with these pros? We're about to find out. 2. Take a photo of your pumpkin by itself and one of you with your pumpkin. 3. Email the photos, your first and last name, and phone number to empirescv@gmail.com by November 1, 2016. We'll post all the pictures on our website by November 6 and let the voting begin! 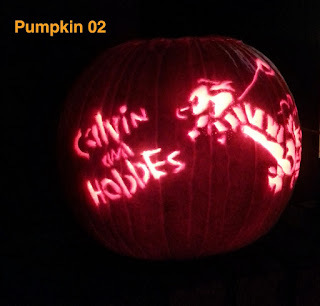 A picture of your carved pumpkin by itself. Contest Description. Empire's Halloween Pumpkin Carving Contest (the "Contest") is designed to encourage eligible U.S. entrants ("Entrant(s)") to express their creativity by carving a pumpkin. Empire's Comics Vault's fans will choose the winning entries via an online poll at http://www.EmpiresComics.com. Prizes will be awarded in accordance with these Official Rules. This Contest is in no way sponsored, endorsed or administered by, or associated with Facebook, Inc., Google, Inc., or any other social media sites used to promote this contest. Sponsor. The Contest is sponsored by Empire's Comics Vault ("Sponsor"), a California company with principal place of business at 1120 Fulton Avenue, Suite K, Sacramento, CA 95821, USA. Binding Agreement. In order to enter the Contest, you must agree to these Official Rules ("Rules"). The Rules consist of the terms and conditions on this page. Because these Rules form a legally binding agreement with respect to this Contest, please read them carefully. If you do not agree to the Rules, you are not eligible to participate in the Contest or to win any of the prizes. You agree that registration for this Contest and/or a submission of an entry in the Contest constitutes your agreement to these Rules. Eligibility. This Contest is open to any legal resident of the United States age eighteen or over, except employees, agents, or representatives of the Sponsor. Only one pumpkin per Entrant is allowed. 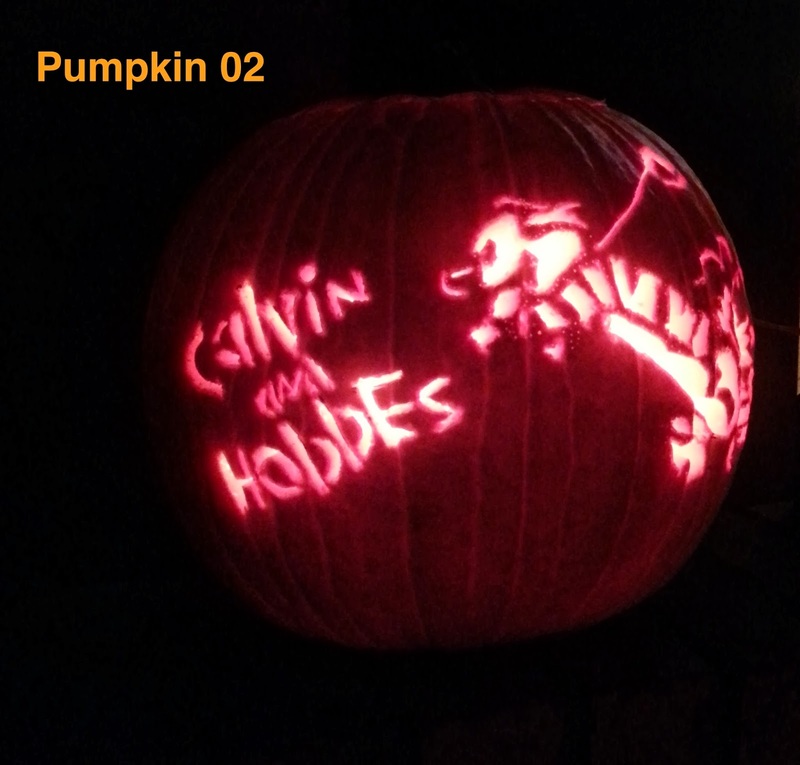 At the time of submission of a pumpkin, each Entrant must be a U.S. citizen or a permanent U.S. legal resident (e.g., must be able to show proof of legal permanent residence, for example, a "green card"). Employees, interns, contractors, and official office-holders, as well as their immediate families, of the Sponsor, its affiliates, and any representatives or agencies of the Sponsor or other persons professionally connected with the Contest are not eligible to participate. This Contest is void where prohibited. Contest Period. The Contest begins on October 31, 2016 at 11:00:00 A.M. Pacific Time (PT). (The Entry Period ends November 1, 2016 at 12:00:01 A.M. Pacific Time.) The Contest ends on November 13, 2016 at 9:00:00 P.M. Pacific Time (PT). How To Enter. To enter, submit to the Sponsor via email two photographs of your carved pumpkin ("Entry") as follows: (1) you and your carved pumpkin, and (2) your carved pumpkin by itself. The Sponsor's email address for submissions is "empirescv@gmail.com." Pumpkins may not be carved at the Sponsor's principal place of business. 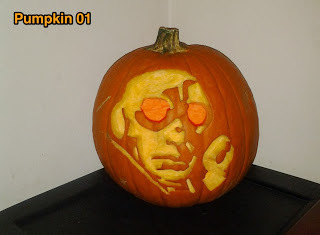 Contest Rules and instructions are posted at http://empirescomicsvault.blogspot.com/search/label/Pumpkin ("Contest Website"). Entries sent by means other than email to email address listed above will not be considered eligible entries. Submissions must be: (i) complete (as determined by Sponsor); (ii) received no later than November 1, 2016, by 11:59:59 P.M. Pacific Time (PT). Any submission not meeting the aforementioned criteria will be disqualified. The Sponsor accepts no responsibility for submissions lost, delayed, damaged, defaced, or mislaid, howsoever caused. Conduct. By entering the Contest, you agree to comply with and be bound by the Rules, which will also be posted on the Contest Website. Failure to comply with these Rules may result in your disqualification from the Contest. You further agree to comply with and be bound by the decisions of the judges, which are final and binding in all respects. The Sponsor reserves the right in its sole discretion to disqualify any Entrant it finds to be: (1) tampering or attempting to tamper with the entry process or the operation of the Contest; (2) violating the Rules; (3) violating the terms of service, conditions of use or general rules or guidelines of any of the Sponsor's property or service; (4) acting in an unsportsmanlike or disruptive manner, or with the intent to annoy, abuse, threaten or harass any other person; or (5) failure to provide documentation verifying U.S. citizenship or permanent U.S. residency. Any false information provided within the context of the Contest by any Entrant concerning identity, postal address, ownership of rights or non-compliance with the Rules may result in the immediate disqualification of an Entrant from the Contest. The Sponsor further reserves the right to disqualify any entry that it believes in its sole and unfettered discretion, infringes upon any third party right, violates any law or otherwise does not comply with these Rules. CAUTION: ANY ATTEMPT BY AN ENTRANT OR ANY OTHER INDIVIDUAL TO DELIBERATELY DAMAGE ANY PROPERTY OR UNDERMINE THE LEGITIMATE OPERATION OF THE CONTEST MAY BE A VIOLATION OF CRIMINAL AND CIVIL LAWS. SHOULD SUCH AN ATTEMPT BE MADE, EMPIRE'S COMICS VAULT RESERVES THE RIGHT TO SEEK DAMAGES FROM ANY SUCH PERSON TO THE FULLEST EXTENT PERMITTED BY LAW. Selection of Winners. Entries will be judged by any person who participates in the voting process by voting for their favorite entry using the online poll found in the righthand column of our website at http://www.EmpiresComics.com available on November 6, 2016. Decisions are final and binding. In the event there are not enough eligible entries, not all prizes will be awarded. If a winner is not able for whatever reason to accept his or her prize, then the Sponsor reserves the right to award the prize to another Entrant. Online public voting starts on November 6, 2016 when the entries are posted to the websited and closes on November 13, 2016 at 9:00:00 P.M. Pacific Time (PT). Empire's Comics Vault will then select the three entries with the most votes to receive prizes. In the event of a tie, two prizes will be awarded at the level that the tie occurred. Prizes. One (1) Grand Prize: The entry with the most votes will receive $25 in regular-priced back issues. One (1) 2nd Place Prize: $15 in regular-priced back issues. One (1) 3rd Place Prize: $10 in regular-priced back issues. Media Activity: By participating in this Contest, you agree and hereby grant the Sponsor permission to use, copy, modify, distribute, and publicly display your Contest submissions for any purpose, such as, but not limited to, press and media communications, without any compensation or attribution to you. You also agree to participate in any media or promotional activity regarding the Contest. You agree that the Sponsor may use your name and likeness to administer and promote the Contest and to conduct media interviews and promotional events. Privacy Notice. By participating in this Contest, you agree that the Sponsor can collect your personal information, and that if the Sponsor cannot collect the required data, you may not be eligible to participate in the Contest. Any personal information collected during the course of the Contest by the Sponsor will only be used for administering this Contest and for other purposes as outlined in these Rules. You will have the right to access, review, rectify or cancel any personal data held by the Sponsor by writing to Empire's Comics Vault (Attention: Privacy Related) at the Sponsor's address listed in Section 2. General Conditions. This Contest is governed by the laws of the State of California, United States. All federal, state and local laws and regulations apply. By participating in this Contest, you agree to be bound by the terms of these Rules and by the Sponsor's decisions, which are final and binding on all matters pertaining to this Contest. Return of any prize/prize notification may result in disqualification and selection of an alternate winner. Any potential winner who cannot be contacted within five (5) business days of attempted first notification will forfeit his or her prize. Potential prize winners may be required to sign, notarize, and return an affidavit or declaration of eligibility, a liability/publicity release, an I.R.S. Form W-9, within three (3) business days and provide any additional information that may be required by the Sponsor. Failure to comply within this time period may result in disqualification and selection of an alternate winner. The Sponsor is not responsible for any typographical or other error in the printing of the offer, administration of the Contest or in the announcement of the prizes. Entrants certify that their submission is original and that they are the sole and exclusive owner and rights holder of the submitted submission (or if they are not sole and exclusive owner and rights holder of the submission, that they have obtained the necessary permission to include the submission in the Contest) and that they have the right to submit the submission in the Contest. Each entrant agrees not to participate in the Contest in any manner that might: (i) infringe any third-party proprietary, intellectual property, industrial property, personal rights or other rights, including without limitation, copyright, trademark, patent, trade secret or confidentiality obligation; or (2) otherwise violate applicable law in any countries in the world. No Recourse to Judicial or Other Procedures. To the extent permitted by law, the rights to litigate, to seek injunctive relief, or to any other recourse to judicial or any other procedure in case of disputes or claims resulting from or in connection with this Contest are hereby excluded, and you expressly waive any and all such rights. LIMITATIONS OF LIABILITY: TO THE MAXIMUM EXTENT PERMITTED BY LAW, YOU INDEMNIFY AND AGREE TO KEEP INDEMNIFIED EMPIRE'S COMICS VAULT AT ALL TIMES FROM AND AGAINST ANY LIABILITY, CLAIMS, DEMANDS, LOSSES, DAMAGES, COSTS AND EXPENSES RESULTING FROM ANY ACT, DEFAULT OR OMISSION BY YOU AND/OR A BREACH OF ANY WARRANTY BY YOU SET FORTH HEREIN. TO THE MAXIMUM EXTENT PERMITTED BY LAW, YOU INDEMNIFY AND AGREE TO KEEP INDEMNIFIED EMPIRE'S COMICS VAULT AT ALL TIMES FROM AND AGAINST ANY LIABILITY, ACTIONS, CLAIMS, DEMANDS, LOSSES, DAMAGES, COSTS AND EXPENSES FOR OR IN RESPECT OF WHICH EMPIRE'S COMICS VAULT WILL OR MAY BECOME LIABLE BY REASON OF OR RELATED OR INCIDENTAL TO ANY ACT, DEFAULT OR OMISSION BY YOU UNDER THESE RULES INCLUDING WITHOUT LIMITATION RESULTING FROM OR IN RELATION TO ANY BREACH, NON-OBSERVANCE, ACT OR OMISSION WHETHER NEGLIGENT OR OTHERWISE, PURSUANT TO THESE RULES BY YOU. TO THE MAXIMUM EXTENT PERMITTED BY LAW, YOU AGREE TO HOLD EMPIRE'S COMICS VAULT, ITS RESPECTIVE DIRECTORS, OFFICERS, EMPLOYEES AND ASSIGNS HARMLESS FOR ANY INJURY OR DAMAGE CAUSED OR CLAIMED TO BE CAUSED BY PARTICIPATION IN THE CONTEST AND/OR USE OR ACCEPTANCE OF ANY PRIZE WON. Third Parties. The Sponsor is not responsible for the policies, actions, or inactions of others, including Entrant’s parents/legal guardian or representatives that might prevent the Entrant from entering, participating, and/or claiming a prize in this Contest. Intellectual Property. By registering for the Contest and/or submitting an entry you agree explicitly that your submission is indeed an original creation. Any intellectual property infringement, misuse or plagarism of another’s work in any form or state will result in immediate disqualification and forfeiture of eligibility to receive all awards, recognition and prizes. You also agree to allow the Sponsor to make public statements regarding any disqualifications and any grounds for disqualification. All intellectual property and industrial property rights in any entries that belonged to the Entrants will remain with the Entrants, but the submissions will otherwise become the property of the Sponsor, and will not be returned after the Contest. You grant the Sponsor permission to use, copy, modify, distribute, and publicly display your Contest submission for any purpose, including display on the Sponsor's website, without any attribution or compensation to you. Internet. The Sponsor is not responsible for electronic transmission errors resulting in omission, interruption, deletion, defect, delay in operations or transmission. The Sponsor is not responsible for theft or destruction or unauthorized access to or alterations of Contest materials, or for technical, network, telephone equipment, electronic, computer, hardware or software malfunctions or limitations of any kind. The Sponsor is not responsible for inaccurate transmissions of or failure to display Contest materials on account of technical problems or traffic congestion on the Internet or at any website or any combination thereof. If for any reason the Internet portion of the Contest is not capable of running as planned, including infection by computer virus, bugs, tampering, unauthorized intervention, fraud, technical failures, or any other causes which corrupt or affect the administration, security, fairness, integrity, or proper conduct of this Contest, the Sponsor reserves the right at its sole discretion to cancel, terminate, modify or suspend the Contest. Severability. If any provision(s) of these Rules are held to be invalid or unenforceable, all remaining provisions hereof will remain in full force and effect. Winner List. The names of the winners will be posted on the Contest Website within one (1) week of the end of the Contest.